M.J. Joachim did a thoughtful review of Bend Me, Shape Me last week that I almost missed. While she did not add the book to her Recommended Reading list, she had many good things to say, including the excerpt below. Click through to read the entire commentary. Let me know if you agree with some of her conclusions. I love learning if there is something I can do better for next time. This is a story that begins with an intensely strong opening chapter, one that startles readers, awakens their senses and captures their attention. Happy endings, albeit nice, seem to soften the blow and dismiss the horror of what life must be like for homeless teenagers on our streets, especially in rough cities like Chicago. 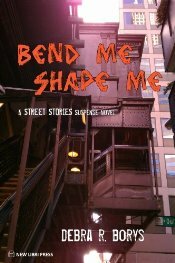 Bend Me, Shape Me is an important testimony for the plight of homeless people, prostitutes, addicts etc. My heart opened wide as I looked beyond the story and felt the desperation and hopelessness they must feel, as I recognized and acknowledged the circumstances which led to their situation. There is no other answer but love and compassion for those left wandering our streets – lost souls in need of hope, assistance and truth without judgment, fear or rejection. This was the meat of the story, the message I hoped Borys would deliver in her conclusion. via M. J. Joachim’s Writing Tips: Book Review: Bend Me, Shape Me by Debra R. Borys.